Hi all, if you are dealing with large applications with loads of write and read operations then each call to database will cost you so much in the performance prospective. Thinking of the above point now a days cache driven applications are given more and more importance. In this tutorial i will taking about the “Oracle Coherence”. Note : This article assume that you already have the coherence downloaded and you know how to run a cache-server. 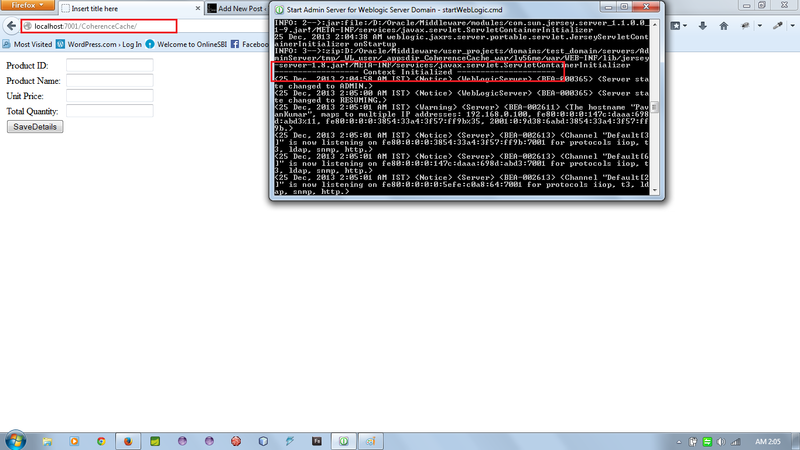 These days its very common to pre-populate the cache before the application starts using the data. In this example i am going to pre-popuate the cache. 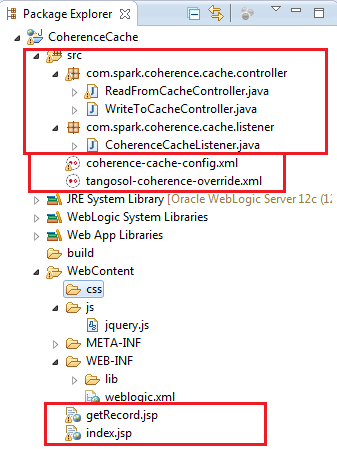 need to use the CacheFactory class, which exposes the getCache method as one of its public members. below is the project structure. first of all let us write the configurations. Step 1: applicationContext.xml – this file has the spring capability to instantiate the beans. In this i have written the DataSource object instantiation. we need to override the tangosol-coherence-override.xml file with our config file entries as below. Once done with our configuration file, let us start writing the jdbc connection factory class. Let us create a CacheRepository class from which we get the NamedCache instance as shown below. 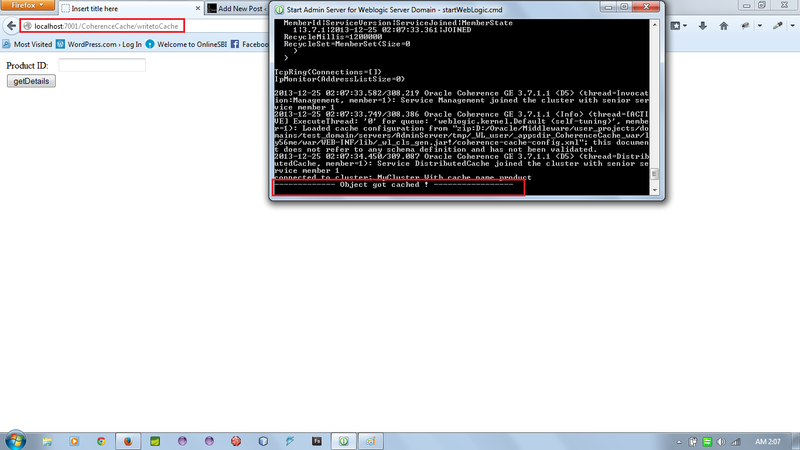 Now its time for to call the service layer and then put the data to cache. That is it we have done with coding part its now time for us to test the application by running the main method. Please observer the main class carefully i have demonstrated the two public methods get(Object) and getAll(Collection). 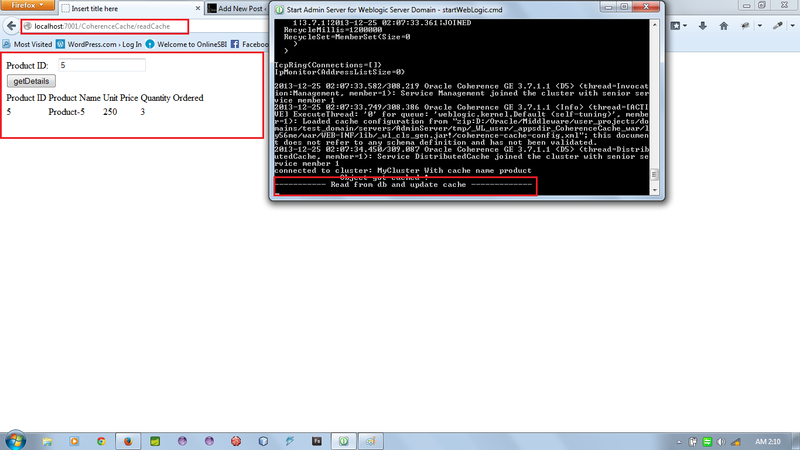 In my next post i will be demonstrating to use the CacheListeners to know if cache is update,deleted or inserted. this write up is very simple if you already followed my previous two topics. In this we shall create a ref cursor which will return group of complex Objects. so first lets have a look at our database part as below. Now we shall start coding our DataAccess Layer Implementation as shown below. Once the implementation of DAO and RowMapper classes are done, its time for us to test with the main class as below. Thats it with the simple above code we can handle N number of complex objects that gets returned from ref cursor. As a continuation to my first part here we can discuss how can we handle complex object types from java to oracle. As an example lets take a “State Object which internally have Capital object” now this complete object should get persisted in single column of table with out joins and multiple tables. lets create database first as below. Now its time to write the procedure implementation for the above created objects. Lets start Coding or Dao Implementation class. Now lets write a helper class which actually create an Object,DataSource,ApplicationContext objects as shown below. now its time for us to write application-context.xml and jdbc.properties as below. Note : uncomment actorDaoImpl.addActor(actorType); to insert the record and buttom three lines to delete set of records as a batch delete operation passing array of ids. The project structure should resemble the screen as below once everything is done. Hi All,these days i got little busy with my new assignment of work in my project finally i took some time today and thought of writing a very nice concept on Oracle Collections and Handling them in Spring framework.Oracle has given a very awesome feature called collections such as “TabType, ObjectType, VArray” etc. Let us create database structure as shown as below. After we create Object types its time to create db procedures which will actually make use of above created objects. 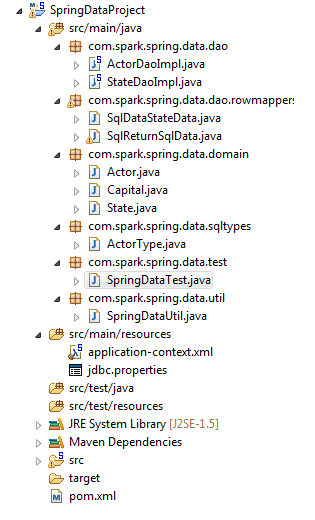 Thats all from database side lets start handling these collection objects using Spring. let use first create domain object which will be serialized to database as below. Now let us create an oracle Type object that will exactly interact with the underlying database. After our Type object is ready we shall start creating the Dao Implementation class which is responsible for persisting the domain object to database. Note : Observer only the type names in above code are case sensitive because oracle stores the Metadata information in capital case. Now we have to implement the RowMapper class which will map the columns from database to our Java Domain object as below. In the above code we used the ExecutorService interface of java’s java.util.concurrent package to load the application-context file from the classpath. 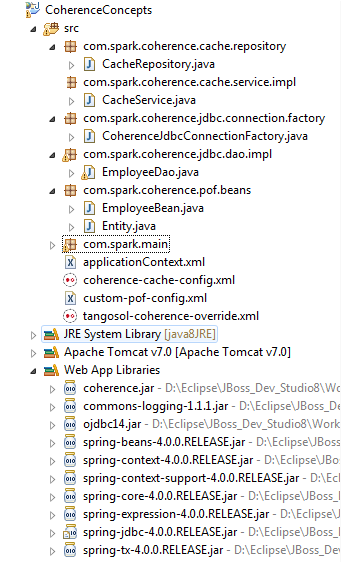 create a dynamic web project in eclipse and put coherence.jar as dependent lib, which acts as coherence server inside the weblogic application server. System.out.println("-------------- Connection Closed Status: "
Once we are done with the insertion of data to database and cache, now its time to fetch the data either from database or cache. here the logic is if data is available in cache the controller pull data from cache if not it will pull from database and also update cache with the latest data so that next time it will from cache but not from database. now in order to connect with our coherence server the following two config files are required. Now as a final step lets run the application by deploying to weblogic server and below are the screen shots. now fill the details and submit the form and it should look as shown. If suppose we query any record that is not available in cache it should get that from database and update cache as shown below. if you query any record that is available in cache, it should directly read from cache and it will not hit database. Advantage of implementing cache technology is, it will drastically improve the performance of the applications. Hello guys, in this post lets discuss how to handle oracle procedure that take custom or array types as input params and return array type or table type as out param. this example has been tested with spring 3.2.x and with oracle 10g xe. note : run the below scripts in oracle to create objects prior to coding java. create or replace TYPE "KEYVALUEOBJECT"
the main business logic exist in this class. The main domain object that will flow in and out to database.